The metal oxide varistor or selenium diode is used to protect semiconductor device against transient over voltage or high dv/dt. The MOV is called as voltage dependent non linear resistor. The resistance of the non linear resistor decreases as the voltage across it increases. It is always connected across the semiconductor device. The characteristic of selenium diode is shown in the figure A. The forward breakover voltage of this diode is very low but is has comparatively higher reverse breakdown voltage. This diode operates in the reverse biased condition. When overvoltage appears across semiconductor, it operates. 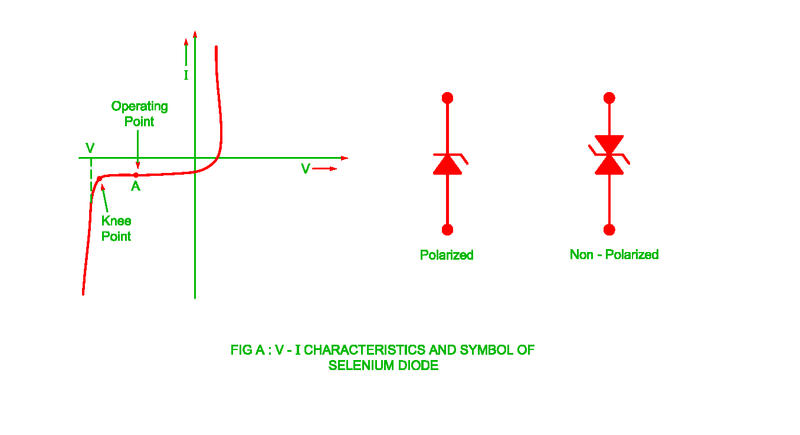 The symbol of both types of selenium diodes are shown in the figure A. The polarized type diode operates only in one direction whereas non – polarized diode operates in both directions.